Premier Work | . : Greg Campbell | Game Designer : . WARNING! MASSIVE PORTAL SPOILERS AHEAD! Portal is a delightful game that is definitely worth discovering for yourself! It’s also available for $9.99 on Steam. If you can tolerate the spoilers (like you’ve already memorized the game, or you need a model game analysis right away), then read on! Purpose of this Document: This is a game analysis of Portal that I, Gregory E. Campbell did, at the request of Michael Schembari. At the time this was done (July 13, 2012), Mr. Schembari was the Talent Acquisition Coordinator for Platform Services at Blizzard Entertainment and Mr. Schembari found my resume on file from a previous QA application. Mr. Schembari seemed impressed with my resume and portfolio, and request I do a game analysis for him. (I had done a game review instead. Oops!) Since game analyses were poorly defined on the Internet, I decided to upload mine to my portfolio site at http://CampbellGregE.com. I included pictures for additional clarity, and because a picture is worth a lot of words. That helped with my 5 page limit. If this helps you get a job or helps you complete a homework assignment, I’d like to know! Email me at CampbellGregE@gmail.com! Game Review vs. Game Analysis: A game review determines whether a reviewer believes the game is worth your time or/and money. A game analysis breaks down the mechanics and explains how they interact. Why Portal? The game is well-known, well-placed, has a small number of parts used in a variety of ways, and Portal is one of my favorite games due to its end song, Still Alive. I could hear the reasoning for some design decisions due to the Developer Commentary mode. What inspired you to use this format for your analysis? I remembered old strategy guides that explained things in similar detail and in a similar format. In short, what does creature/object/ability X do, how does it interact with other notable creatures/objects/abilities, and what special things should unaware players know? How long did this document take to create? The original analysis took about 7 hours, or one intense night. I got to bed after 5AM. At least I could sleep in! That night involved starting on analyzing Portal 2 then realizing I lacked the space and time to complete it. (I only had 1 night and 5 pages to work with.) I went for Portal instead because, mechanically, Portal 2 is just Portal 1 with more elements. Why should I seriously consider this game analysis template? It got me a phone interview with Blizzard! Michael Schembari (who was basically a QA Hiring Manager) was there, along with QA Supervisors Michael Burghart, Amadeus PhanThanh, and Christopher Clarke. Other Advice for Writing a Game Analysis: First, carefully read the instructions! If you miss a step, expect to be disqualified. Following directions is a large part of working with others! Assuming you have a choice, pick a game that you know and love with a small number of elements. You will be explaining every notable one. This explanation includes cross-referencing other game elements. For example, I don’t mention chairs and office items in my below analysis because, though a chair is useful to solve one of Portal‘s puzzles, it is mostly forgettable background scenery compared to more important elements, like cubes. Even if there is no specific page limit, expect to have a time limit, and expect to hit at least one of these limits. BIG NOTE: Don’t try to use this Portal analysis in its entirely! (That’s what people call stealing.) The Blizzard team already read it and probably has it on file. Consider this Portal analysis to be an example for the game that you analyze! Of course, if you believe you can improve upon this game analysis template, then go right ahead! I’d also like to hear how you do so via email! Exit: The goal of almost every level in Portal is to reach the exit. Most levels have an exit elevator that leads to the next level. Because players know this, they have a clear goal, and they can focus their efforts on finding the exit and knowing that they are done with the level. The final level is an exception. It is a boss fight. By this point, players have had ample time to anticipate this encounter and know it is the end of the game. Material Emancipation Grill: This thin blue wispy overlay, usually in front of exit elevators, prevents everything besides Chell and the portal gun from passing through it by instantly vaporizing this material on contact. This is done to ensure people cannot smuggle items into puzzle rooms. This elevator and Emancipation Grill mean the level is complete! –Movement: Portal relies heavily on character movement in a 3D environment. This includes basic movement on the X and Y planes; jumping to cross gaps, avoid obstacles, and reach higher heights; falling to gain momentum and indirectly reach higher heights; and crouching to avoid obstacles. Clever movement, combined with portals and the portal gun described below, are the foundations of navigating the world of Portal. –Interaction with Objects: Chell can pick up and hold one object at a time, and can drop or throw the object she holds. Placing cubes on buttons is necessary to keep these buttons pressed when Chell is not on them. Chell can push a small red button to use it, thereby triggering an event, such as keeping a door open. The events caused by these buttons have an audible time limit so players know how long they have. Chell can also open and close some doors, and occasionally use other objects that the game makes fairly obvious. Opening doors and interacting with these miscellaneous objects subtly reminds the player that the Aperture Science complex was once inhabited by people, and is not just a series of levels or puzzles. Portals: These blue and orange portals are linked. Whatever goes in one portal exits the other with the same angle and forward momentum. Also, a player can see what is through a portal by looking at this portal. Portals are the basis of this game. They are used to allow the quick traversal of great distances, the reaching of otherwise impossible places, and the attaining of tremendous speeds while the player shouts, “Wheeeee!” GLaDOS, the game’s announcer and antagonist, even says, “Wheeeee!” regarding a portal fling. Portal Gun (“Aperture Science Handheld Portal Device”): The portal gun shoots portals onto legal surfaces. Initially, the portal gun shoots only blue portals, while the orange portals are at fixed locations in the levels. However, the portal gun later shoots both blue and orange portals with separate buttons. Because the player has a portal gun, he controls where the portals go within his field of view. The portal gun also makes possible the ‘portal fling,’ where the player makes an exit portal, falls from a great height, then shoots a portal in front of him on his way down. The result is being tossed a great distance at high speed, allowing him to cross gaps. The portal gun can also hold a either single cube of any type or a turret at one time. The portal gun was included as a gun because a gun that shoots portals provides far more gameplay potential than static portals. Early levels have the player without a portal gun to acclimate him to moving around and solving puzzles. Upgrading to a portal gun that shoots only one portal while the other portal is static in the level acclimates the player to the freedom the portal gun provides, and gradually transitions the player to understanding the full potential of being able to control both portals. Walls, Ceiling, and Floor: Many surfaces in Portal can have portals on them. Some cannot. A surface can only have a portal on it if there is enough room for a portal, and the surface’s material allows it. For example, a moving platform can never be a portal surface. Anything going through a portal preserves its angle and forward momentum. Of special note are diagonal panels. Due to physics, anything leaving a portal placed on a diagonal panel normally flies farther than if the portal were placed on a flat, horizontal surface. Using walls, ceilings, and floors as portal surfaces makes sense in a generally sterile environment. Shoot a portal on the left side to see out the opposite portal on the right and get the box. Boxes (“Weighted Cubes”): These solid boxes are very versatile. A weighted cube (and in one level, the famous Companion Cube) can serve as a step, and press a large red button. Also, turrets can be knocked over by a player who shoots or a drops a cube on a turret or who rams a turret with a cube with sufficient force. Boxes were made into cubes as part of the minimalistic game aesthetic, to keep them stationary, and to allow them to be used as platforms by inventive players. Large Red Button: This large red button is activated by placing a box on it, or by standing on it. Activating a large button usually opens a door. Some doors or effects require more than one large red button to be activated at a time. Large red buttons were included to make obvious that players had to find a box to put on it. The color red was most likely chosen to make the button obvious in the game’s environments, which are mostly devoid of red. Place cube on large red button. Open door. Proceed. Small Red Button: This small red button is on a pedestal is activated by standing near it and pushing the use key. Activating a small red button opens a door or panel. Typically, a door opened by a small red button is timed. If so, there is an audible clicking noise to indicate that time is ticking away. The small button, being on a pedestal and angled toward the player, invites the player to use it. Also, the designers stated in Developer Commentary mode that the small red button is a contrast to the box/large red button combo that players came to expect. Click, click. Click, click. Click, click. High Energy Pellet and Socket: A white device releases this glowing orange pellet at regular intervals. The pellet has a finite lifespan, after which it explodes, and a new pellet is released. The goal is to get the pellet into the socket to get a platform to move. This pellet bounces each time it hits an object or a solid surface, but leaves a scorch mark where it hit. Touching it is damaging, even deadly. The high energy pellet was given a finite lifespan to prevent it from being trapped due to bouncing, and to give players the feeling they were dealing with an unstable object. The socket projects an orange light onto the wall to help players guide it in via a portal. Guide the orange ball from that top left white thing into that socket projecting orange light? Check. Turret: This small, stationary, white tripedal creature has a single red eye near the middle of its front. The eye has a non-damaging red laser that follows Chell once she is in range. Sometimes, the turret will move its laser about, seeming to scan the area for trouble. Once a turret finds Chell, it fires a nonstop barrage of bullets until Chell leaves the turret’s sight or the turret is disabled. Turrets even fire at Chell through bulletproof glass. Turrets are easy to disable in theory and usually easy to disable in practice. Dropping a box on a turret, ramming a turret with an object, or grabbing then throwing a turret will disable it. Turrets do not rotate, making sneaking up on them a breeze, provided there are no other turrets or hazards. Turrets succeed in their goal to be cute little robots. Their sleek form combined with sing-songy innocent-sounding voice clips- such as “I don’t hate you,” when disabled- give them tremendous personality. As mentioned in the Developer Commentary mode, turrets were included due to the designers wanting a light combat mechanic. Their shape and voice makes them cute, memorable, humorous, and, at times, sinister. They are the closest representation of GLaDOS the player gets for most of the game. GLaDOS: This immobile bot is the player’s guide throughout the game, and the antagonist. She is the game’s only boss fight, and is a timed boss fight at that due to story reasons. During the fight, she shoots rockets (damaging to you, if not deadly) with a green laser sight. The goal is to make portals to have her hit herself with the rockets. Each time she hits herself, the player must retrieve a part of her that got knocked loose, push a small red button to open the incinerator hatch, then incinerate that part. Do this thrice to win. Since GLaDOS tried to kill Chell earlier this level, this boss fight is Chell’s and the player’s chance to fight back! Needing to destroy her parts makes her seem durable, yet vulnerable. Lastly, beating her does not kill her, according to the popular end song, Still Alive, which sets up excitement for the sequel, which arrived in 2011. Greg Campbell was responsible for all work to create and present this game analysis; however, images used in this presentation (except for Greg’s work on the Portal Game Analysis logo and the Portal Game Analysis banner) are not Greg’s property, but are instead property of their owner(s). The Portal game series (including its logos) is property of Valve Software. Greetings, and welcome! « . 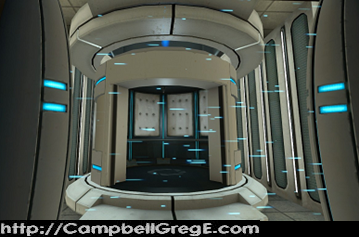 : Greg Campbell | Game Designer : .